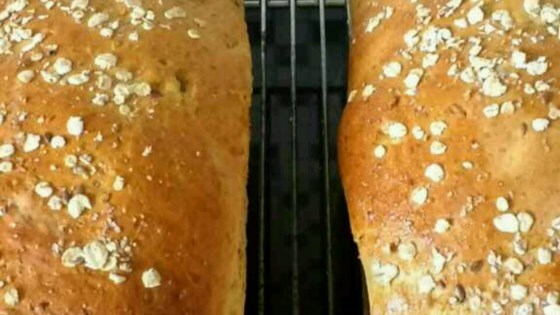 "This is a very good bread to have with baked beans, or just on it's own. This recipe can also be used to make rolls." Combine boiling water, oats, shortening, brown sugar, salt, and molasses. Allow to cool. Stir 1/2 cup warm water and 1 teaspoon white sugar until sugar is dissolved. Sprinkle yeast over this mixture, and proof while oats are cooling. Add 3 cups of warm water to the cooled oat mixture. Stir in yeast. Begin stirring in flour 1 cup at a time until it begins to get hard to stir. Dredge raisins in flour, and mix with cinnamon; mix into the dough. Turn onto a lightly floured surface, and knead in enough flour to make a soft but not sticky dough. Cover. Let rise for 1 to 2 hours in a warm place, or until dough doubles in size. Divide dough into 5 parts. Shape loaves, and place into greased 9 x 5 inch loaf pans. Bake in a preheated 375 degree F (190 degree C) oven for 20 minutes. Reduce heat to 350 degrees F (175 degrees C), and bake an additional 20 minutes. Cool on wire racks. A little too dense and heavy for my taste. I used light flavored molasses, but it was still a bit strong, it definately overpowered the cinnamon flavor.